Last week, I led an Advanced Sailing course on a yacht delivery from my new home on San Juan Island to San Francisco, California. I was joined by fellow captain, sailing instructor, and renowned ocean rower Erden Eruc. Our students included the owner who plans to sail the boat, an Island Packet 350, to Columbia in the coming years. The rest of the class were students from California and Washington. All of the crew had the sailing experience and prerequisite classes necessary to be eligible for the journey and certification. The testing and instruction was to be done underway. We put a navigation course together for the crew a week before the departure, and included a midnight shakedown sail on GBA's Cal 40 "Journeyman". Everyone successfully demonstrated a nighttime sail change, reef, and crew overboard recovery. We also began working on the task of meal planning together a week beforehand; Its quite common for sailors to not have much of an appetite for the first few days, but after that it is one of the true comforts at sea. It’s important to think ahead about meals on a passage like this: recipes that are easy to prep ashore aren't so easy offshore. Before departing Seattle for Friday Harbor, the boat was provisioned with a Costco run that met all the dietary restrictions we had aboard. Once the boat and crew arrived in Friday Harbor, we spent a day working on the last bit of provisioning and trip preparations. We bought all the fresh fish we needed from the floating seafood store in the marina, as well as 6 dozen farm fresh eggs that could be stored in the dry lockers without refrigeration. I installed the lee cloths I made for the boat: a crucial item for sleeping safe and sound in a seaway. 20 gallons of spare diesel in jerry cans were also filled and secured on deck, a lesson in the essential skill of lashing necessary items when there is no room for them below. We left on the last of the flood and headed south with light 5 knot northerly. Once you cast the lines off, all the frantic pre trip stress from all the prep drops away and you are left with the moment you are in and the weather forecast ahead. We motored out of the Straight of Juan De Fuca in calm glassy seas. This gave us the opportunity to do some dead reckoning (DR) practice, provided an introduction to the vessel traffic rules, and learn the system of lights for nighttime travel. Once we cleared Cape Flattery and entered the Pacific Ocean, our attention went to the weather systems that were developing off the coast. The experience of sailing the west coast during October on the cusp of winter weather can vary widely. This time of year, there is an increasing risk of strong southerly winds which makes sailing south difficult and sometimes dangerous. One week before we left, the forecast for our departure called for 25 knot winds out of the south and needless to say, this was a concern. Fortunately, the forecast was wrong and westerly winds developed allowing some beautiful reaching. Anyone who has beat into 25+ knots of wind and the seas that come with them on the Washington coast knows that motoring is not that bad. Running the "Iron Genoa" is fine, but it means one needs to keep an eye on fuel consumption and the wind forecast for the rest of the passage. You need to have reserves for the possibility of light winds ahead necessitating motoring to stay on schedule. We ran DRs down the coast to potential fueling destinations, looked at the tide tables to see if the entrances and their bars would allow crossing at our ETA’s, and if the fuel docks would even be open when we arrived. We decided that Coos Bay would be perfect to top off our tanks so we were ready for whatever lay ahead. Coos Bay is a beautiful place, and our stopover was no exception. When we negotiated the somewhat confusing lateral buoys that mark the entrance, the coastline was calm. Puffy Cumulus and Cumulonimbus clouds skirted the coast, giving no sign of the weather we were now anticipating in the coming days to the south. Our light to moderate conditions were going to turn to possible 40 knot gusts and 14 foot seas. The only thing that gave us solace was that the wind was forecast to be from the North and Northwest. The job now was to run DRs to the coves and harbors along the coast so we had a plan if, in the remaining days of our passage, we decided we needed to head in until the weather passed. Again, bar crossing and time of day we would arrive were all calculated and the invaluable "Charlie's Charts" was consulted. We found that at our speed and based on our location, we would not arrive in these harbors in daylight hours and that once in and the weather upon us, we would be stuck for days as the bars or their entrances would be closed or unsafe. The crew came together, deciding that it was more prudent to stay out than to risk going in further down the coast and preparations were made for heavy weather. The 35 foot Island Packet we were aboard had been in charter in the Puget Sound and had all the amenities of a charter boat. Fridge and freezer, large head with shower, TV, kitchen appliances and cooking utensils were aboard. At one point I counted 4 different coffee making apparatuses aboard; they were being used in some sort of experiment to see if pour over was better than press or percolator. Now was the time to stow everything that could break or provide a hazard. The rugs on the cabin sole were stowed and towels were stuffed in with the ceramic and glass. Then a plan for food was made. We had frozen lasagna and pizzas to put in the oven if no one felt well enough to cook, and we precut and cooked a bunch of potatoes for a clam chowder to could make in a single pot once the seas began to grow. One pot cooking is important when a number of people need to be fed quickly, and to limit time below decks where an eye on the horizon is key to maintaining an appetite or even your last meal. Our boat had a two burner gimbaled stove that worked very well, but when working in the galley some have found that running a strap to hold the chefs balance while his or her hands are full is a real help. That said; it’s always a good idea to cook in your foul weather bibs and sea boots as a large pot of boiling food could seriously hurt a sailor. Photographs never do waves justice. Our plan had us slowing down to catch the lighter wind around the cape we were most concerned about. This was a welcome break from having to motor every time that the boat speed dropped below 5 knots. We discussed boat balance and shortening sail for the coming wind with the entire class. When the wind increased we began shortening sail, leaving more sail area forward of the center of lateral resistance, and ran a preventer. Once we found the right sail plan the helm was surprisingly well balanced. The seas did pick up and a few even broke into the cockpit. We had to run the engine after 24 hours because we were running the freezer, and when the engine was on we did our chicken jibes. This is a maneuver that involves tacking through the wind instead of jibing the main sail. Jibing when it’s gusting 40, even with a heavily reefed main like we had, can put a breaking load on the booms rigging. To prevent this, you can do a 160 degree turn up through the wind and waves. Tacking through the wind presents its own problems: this means the boat is turned beam to the seas at the beginning of the tack as the boat heads up, and as it bears away back to a broad reach. Coordinating this with breaking seas is a little stressful and for a moment, when you are head to wind, you feel the full power of the wind and seas. I had the helm for the first one and we furled the jib all the way in (moving the center of effort aft), released the preventer, and when I saw the smallest wave put the helm over and brought the RPMs up to 3000 to power through the wind. Two hands on the helm. After the wind and waves subsided in the lee of Point Reyes we began our approach into the San Francisco Bay. One of the students was taking advantage of the calmer sea state working on the written portion of the Advanced Coastal test. As it turned out the dolphins and whales weren't the only distractions to the more academic part of the adventure. The tight formation of Blue Angels suddenly shot into view and all phones and cameras were out. Turns out, SF does Fleet Week big and we were not the only one reentering the stratosphere; the strange light guided us into our marina in Emeryville that night turned out to be the SpaceX spaceship landing. All in all a great passage and epic learning adventure. Thank you Kirill Knovitchenko for the pictures. Journeyman at the start of the Oregon Offshore. I am proud to say that Griffin Bay Adventures' first class was a success. This passage was emblematic of the kind of educational adventure I am looking forward to continuing to offer. The smiles as we passed the bottle of champagne around on the dock in Victoria Harbor after our finish made all the work and that lead up to the passage and the hardships of passage totally worthwhile. 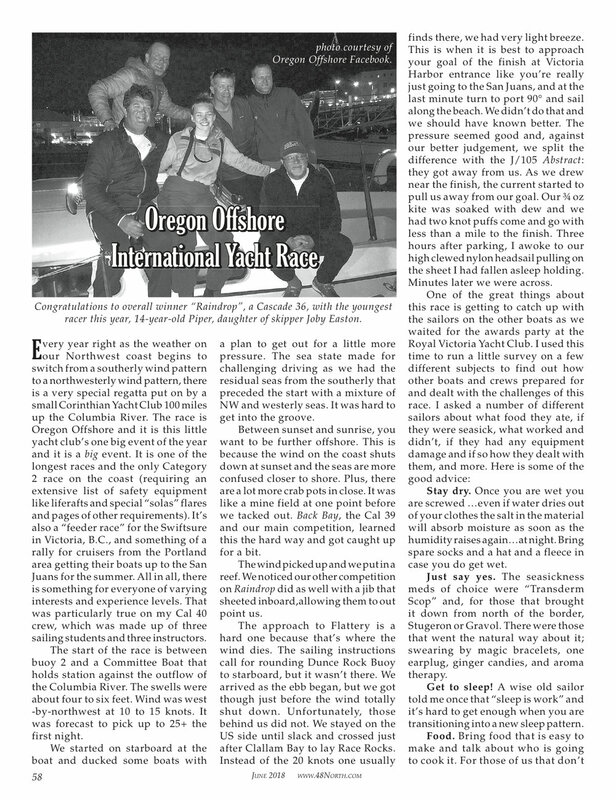 The comradery that comes from a 300 mile trip up the Washington Coast and down the Straights of Juan De Fuca is what keeps people coming back to this challenging and rewarding race every year. The crew consisted of three students; a father and two sons and three instructors.